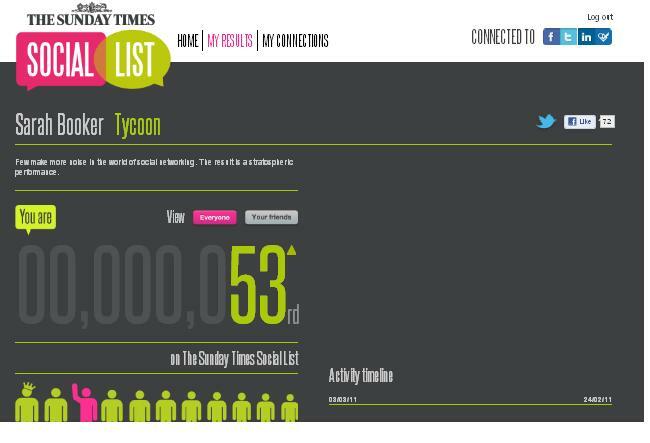 Curiosity led me to the Sunday Times Social List after spotting a few #stsl tweets and reading this blog by Adam Tinworth. I don’t consider myself influential, I share the occasional opinion and find other people far more interesting, but put myself on the list anyway for a laugh. In some ways this is a bit like Word Nerd, the Times game to show how clever you are. It was fun for about half an hour and a great piece of promotion. At Journalism.co.uk we created a top 100 most influential journalists in the UK, in early May. We seeded the list with 50 people and then threw it out to the crowd. There are journalists missing from this list, but the people on it were nominated by their peers, and then ranked according to PeerIndex‘s algorithms. Personally I don’t think there is a definitive list. There are people who are useful and interesting to you, and they are the most important. The first Brighton Future of News Group took place yesterday (Monday, February 8), attracting a variety of journalists, writers, bloggers and techy folk, all interested in telling stories and relaying facts in new and interesting ways. Our first speaker was Jo Wadsworth, web editor at the Brighton Argus, who spoke about building a community of bloggers writing on specific themes or hyperlocally, the sort of news that might not make it into the newspaper, but will be of wider interest. Examples included the Bevendean Bulletin, which uses the Argus in lieu of its own website. Student reporters from the Journalist Works gaining experience by writing patch blogs, and others are aspiring writers dipping their toes in the water. Jo was keen to point out the bloggers aren’t considered a replacement for reporters, but rather augmenting the newspaper’s website. After all, as Jo explained, these people will be blogging anyway why not utilise their enthusiasm and talent for the paper? The bloggers benefit from a ready-made audience and technical support, the paper gets street-level coverage. Jo cited the pothole paradox hypothesized by Steven Berlin Johnston ie. extremely local, small-scale news is interesting to people living in a certain street with pot holes but not to those living a few streets away. When it comes to looking after a paper’s bloggers, Jo advised giving constructive but honest feedback and never be afraid to turn people down. I was pretty pleased to hear there was a high turnover of bloggers and some who didn’t even start, as I’ve had similar situations with a number of ex and failed-to-starters. The second speaker Simon Willison initially talked about his work creating the software and database for The Guardian’s MPs’ expenses crowd-sourcing project, where more than 200,000 documents were studied in the search for interesting information. The structure was put together in a week before 450,000 documents were dumped into the public domain during this act of government “transparency”. It was a steep learning curve for the team behind the project, but it was developed on for the second release of MPs’ expenses information for 2008/9 and the first quarter of 2009/10. A few thousand documents were torn through by the crowd. Simon and the team created a wider variety of tags for each page, such as food or soft furnishings. Hand-written pages were often particularly interesting, such as a lengthy note from Jack Straw. My personal favourite site Simon has created is Wildlifenearyou.com where people can share their pictures of wildlife, both wild and captive. It’s an amazing site where people can vote for their favourite pictures of animals, add their own, find creatures geographically. It really is imaginative. It was pretty impressive to see what could be created by people with the imagination and skills to make something happen and not just draw ideas out on paper. Both talks definitely fired the imaginations of everyone involved who took part in the break-away sessions at the end of the evening. The four groups came up with multimedia ways to cover Brighton Pride, this year’s general election and transport issues. A particular favourite of mine was creating a spot the candidate Google map. Now that’s an idea with legs. A document of all the event’s tweets featuring the hashtag #bfong. Laura Oliver, editor of Journalism.co.uk also blogged about Jo Wadsworth’s and Simon Willison’s presentations, as did John Keenan. Judith Townend, from Journalism.co.uk organised the event at The Skiff and put together a summary linked with the first Future of News Group West Midlands meeting, which took place on the same evening. The original UK Future of News Group was set up by Adam Westbrook. Journalists and new media folk in Brighton and Sussex are invited to join the UK Future of News Group Brighton nest. It’s an opportunity to discuss new ideas within the news industry with like-minded people. The first meeting on Monday, February 8, is at The Skiff in Brighton from 7.15pm. Simon Willison the man behind Wildlifenearyou.com and the Guardian’s MPs’ expenses crowdsourcing project and many other projects. Jo Wadsworth web editor at Brighton’s Argus newspaper. Jo will be talking about building an online community and blogging. The original UK Future of News Group set up by Adam Westbrook has held two meetings in London, with interesting speakers and great networking opportunities. I couldn’t make it to January’s meet and felt extremely jealous reading the #fong and #futureofnews tweets. After joining the London group I started a thread on the message board asking if any Brighton-based media folk would be interested in setting up a ‘nest’. Withing 24 hours of my post Judith Townend of Journalism.co.uk was ready to run with the idea. My contribution? Well, I’ve invited many Johnston Press journalists from across Sussex. Fingers crossed this will be a great regular event.